How to prepare your bicycle for travelling by plane? I have been travelling quite a few times with a bike recently and had to go through a research process to find the best way of preparing it and the panniers / luggage for flying. This includes packaging, security, etc. Different companies handle the process of purchasing bike space on the plane differently. Most low cost companies that I have used, such as Ryanair, WowAir, WizzAir, EasyJet have the option to purchase “Sports equipment > Bike” when you buy your ticket. However, some other companies such as British Airways have the process a bit more unintuitive. Instead of purchasing “Sports” equipment, you have to purchase another regular suitcase luggage piece, which you can then “use” as the one counting toward your bike. Average prices from my experience are from £25 – £35 depending on the company and possibly on the route. Overall, a very good value for using your own bike that you have set up to your needs and can rely on, rather than hiring a different one at your destination. At least that is my personal opinion (this is only valid for trips longer than a week, for shorter ones it might make sense to just arrive with your luggage and rent a bike). These are all pretty simple and straightforward to do. I normally do them once I arrive at the airport. Including, tying the pedals to the back rack, I also tie my tent poles and camera tripod to the bike frame (with some padding in between), remove the bottle cages (as mine are plastic and can break, but you can leave metal ones). One other trick I’ve learned is to cut a large 2l bottle in half from one side and wrap the rear derailleur in it to protect it from nocks. I’ve not had issues so far. My frame is a size L or about 54/56cm and at some airports they struggled to put the bike through the scanner, so I had to remove the handlebars completely from the stem and attach them to the frame. But that’s about it. A lot of people like to put their bike in a bike box. This protects the bike, allows you to pack it more compact so you have less issues (i.e. passing through scanners). 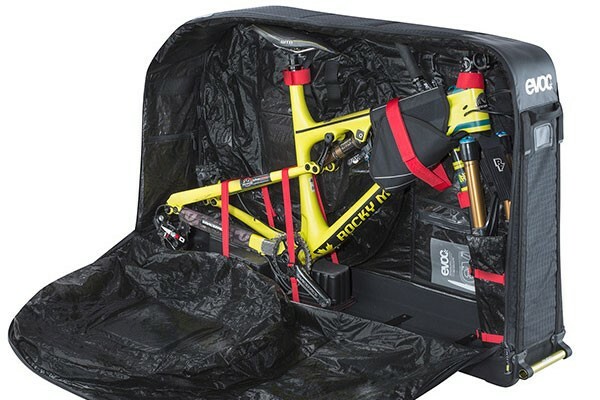 It is less likely for people to open the box and touch your bike, and if it’s a carbon frame you can make sure it is well packed and protected, plus you have the added benefit of more space in the box where you can squeeze some of your other luggage and potentially travel just with hand luggage. However, I have one big problem with the box approach – I have no where to leave the box once I arrive, some of them cost a lot and normally I don’t leave from the same place where I’ve landed initially, so I cannot pick my box up. Yes, you can post the box to your final destination for the trip, you can use a cardboard box from a local bike shop, but all of this sounded like a lot of hassle for me. My bike was £200 and not really worth the effort. If I had a more expensive bike, I would definitely consider this approach. My approach is using a bike specific plastic bag. It is much tougher nylon, that can resist some handling at the airport. Moreover, the bag is light and I can easily carry it on my rear rack and normally double its use as a tent groundsheet, which has been invaluable in some very wet situations. I can also make a tarp of it or hide under in very very bad weather. The one in particular I use is the CTC Cycling UK Plastic Bike Bag (this is not an affiliate link). It lasts me about 6-8 passes through airports. Notice the duct tape patches on the nylon bag. Now you might be thinking “YOU ARE LEAVING THE BIKE JUST LIKE THAT?”. The answer is – yes. 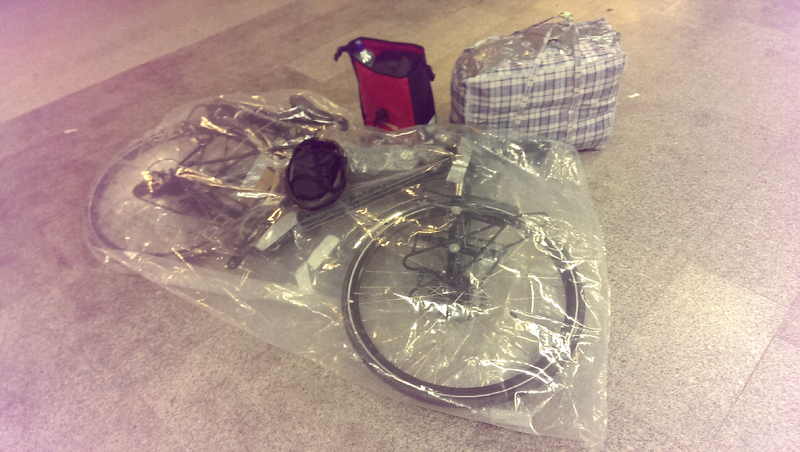 Apparently, the people handling the luggage seem to take more care of the bike when they can see it’s a bike. If packed in a way where they can’t see what’s inside, they are more likely to just throw it around. Don’t hold me to those words as so far I haven’t had issues (so far), but if your bike is too expensive, don’t risk it. Since I want to travel cheaper, I don’t want to pay separate luggage fee for each pannier. Some low-cost airway companies will charge you for up to 25-30kg and for each piece of luggage that you have. Because the pannier’s combined weight shouldn’t be over 25/30kg I fit well within that. However, if you just arrive at the airport with the panniers as they are, you might have to pay a luggage fee for EACH of them individually. What I do to keep my weight low is to pack 3 of the panniers (two rear and one front) in a “Chinese laundry bag” which is extremely lightweight, costs about £0.50 and is very durable, or at least strong enough to last me a single trip. It also doubles as a nice little matt to sit on and tucks well with the plastic bag on the rear rack. Finally, I take one of the smaller front panniers with the handlebar bag in it and the helmet as my hand luggage to the plane. Make sure you have no tools, knives, cooking materials, etc. in that pannier. Bike travel is cheap and going on a plane with your bike shouldn’t be much different. The more you invest in your bike, the more you will need to invest in protecting it and keeping it safe when you travel. For me the bike plastic bag and the Chinese laundry bag for the panniers have worked perfectly so far. Please let me know if you have any questions and comment on what is your preferred way of travelling on planes with the bike. If you do use a bike box, where do you store it and how do you get it at the end? Really? Just need a bag over the bike? I thought everything needs to be taken down and reassembled ? what do you use to protect the rear derailleur ? I either take it down and tie it to the frame with a zip tie, or I cut a large 2l bottle in half (one side) and slide it onto the derailleur and tie it with duct tape. You don’t need to take everything down, just what I’ve highlighted above. I’ve travelled this way through airports around 8 times so far and it has worked for me. We also use Chinese laundry bags, however we use the other nickname Ghana to Go bags. 🙂 We have used the same ‘Ghana bags’ for four long flights and they are still going strong. We always fly out of a different city/airport than we flew in to so this (traveling with bikes) is an issue. This last flight, we ditched the cardboard bike boxes and used industrial strength shrink wrap (15 euros for a huge roll). 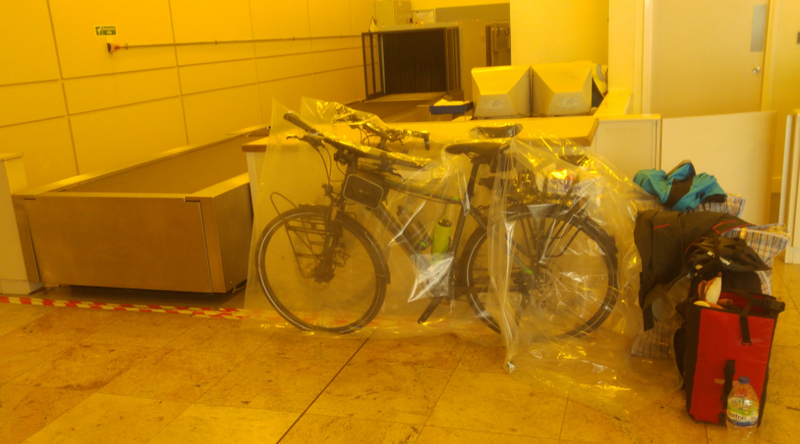 Unfortunately the bikes did not fit in the scanner, so by the time we we got them upon reaching our destination, security had cut through our beautiful shrink wrap job and our bikes did get some dings. We did see them being loaded on to the plane and to my disappointment, the handler did not treat the bike nicely even though it was clear what it was. Luckily our bikes made it through though and just have some minor scars to show off! 🙂 I appreciate your article because I find this topic to be one of the hardest things about cycle touring. Everyone I meet online/on the road never seems anxious about it! But I worry about it and start planning it from the moment I book a trip.. the logistics can be difficult. And the fees for a bike can be outrageous. (I am from the USA and was almost charged $200 PER BIKE on an American airline.. Thank GOD the counter person could not figure out how to charge us what he was supposed to. We got lucky that time.. but I actually book flights specifically based on their fee now.) I think I may try the bag idea you have presented. 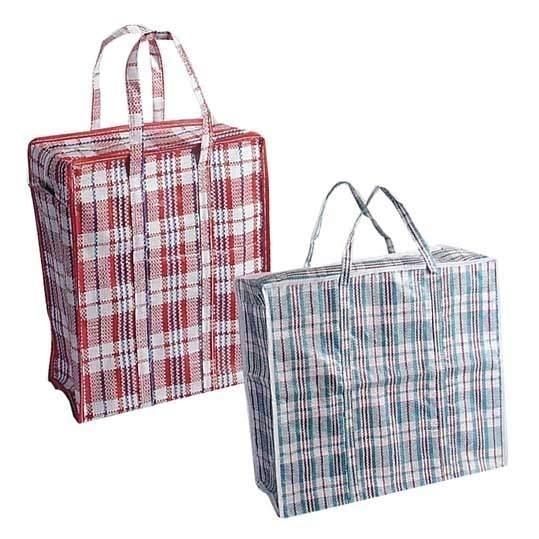 I love the idea that I can travel with the bag, just like the Ghana bags. Cheers and Thanks again!